Asian ginseng or Korean ginseng has been used in eastern medicine for thousands of years as a panacea "cure-all" to treat a wide variety of illness. The root is primariy used and is usually grown for at least 4 years before harvested. White ginseng is obtained from drying the fresh root. 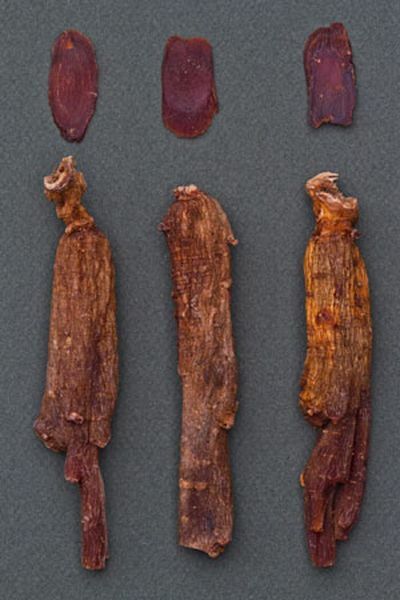 Red ginseng formed by steaming the roots before drying them. The steaming process modifies the chemical composition making certain constiuents more bioavailable, active and more desirable. Korean ginseng is one of the most important herbal supplements in Asia and one of the worlds most expensive herbs and the cost increases with the age of the plants. It is generally used short term in healthy people as an adaptogen to help decrease the negative effects of stress and increase stamina. research shows it acts as a nootropic to improve mental function like concentration and stamina.